Not sure what you will be having for lunch today? 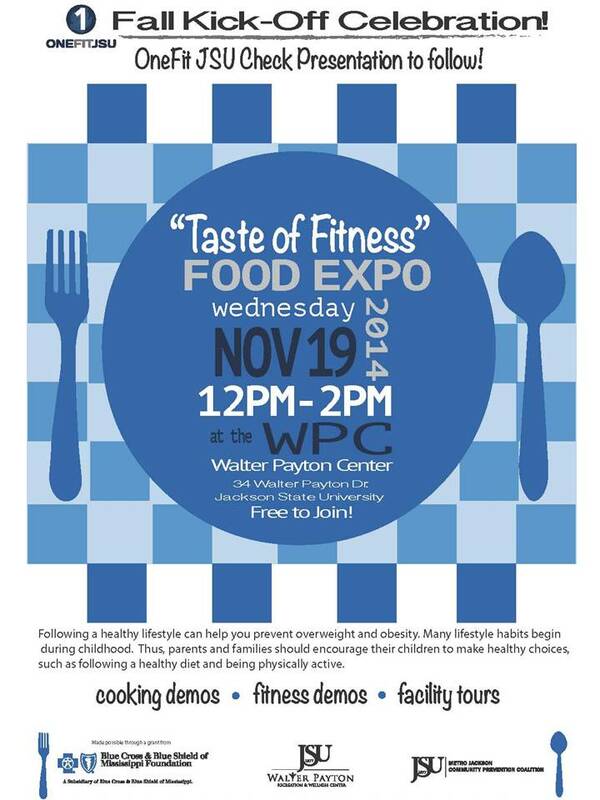 Well you should stop by the Walter Payton Center for their “Taste of Fitness” Food Expo today from 12:00 pm to 2:00 pm. This is for the kick off celebration of One Fit JSU, which is a healthy initiative to promote healthy life styles. The executive chef from The Penguin Restaurant & Bar, Mr. Coleman, will be preparing some delicious menu items for you to eat! Also there will be food provided by Piccadilly, McAlister’s Deli, Country Fisherman, and Edible Sweets. “Taste of Fitness” is made possible through a grant from the Blue Cross & Blue Shield of Mississippi Foundation and this is the kick off event. The event will also feature a check presentation at 2:00 pm from Blue Cross & Blue Shield of MS Foundation to JSU in the amount of $129,000 dollars. The grant funds are to be used for community based health events such as the “Taste of Fitness.” So come enjoy and learn about the new One Fit JSU Program! There will also be opportunities for you to get massages, Body Mass Index testing, and do tours of the Walter Payton Center. The Walter Payton Center is located at 34 Walter Payton Drive. For more information contact 601-979-1368.